To ensure employee productivity and satisfaction with Power BI, enterprise organizations develop comprehensive product training, bolster their help desks, and invest in helping their user communities with internal forums to share ideas and best practices. But it can be a challenge to educate users about the availability of these organizational resources. The exciting news is that Power BI can now help you master this challenge by customizing the help and support links in the Power BI help menu to point your users to specific organizational content rather than the default Microsoft sites for Guided Learning, the Power BI community, and the Power BI support forum. Logged into Power BI as a service admin, go to the admin portal, display the Tenant settings page, then expand Publish “Get Help” information, toggle the Disabled button to Enabled, and then provide appropriate URLs to your company’s sites for training documentation, discussion forums, and help desk, as in the following screenshot. Respectively, these parameters change the behavior of the Learn, Community, and Get help menu items in the main Power BI user interface. In the Tenant settings, note also that you can customize the link to acquire a Power BI license as well! 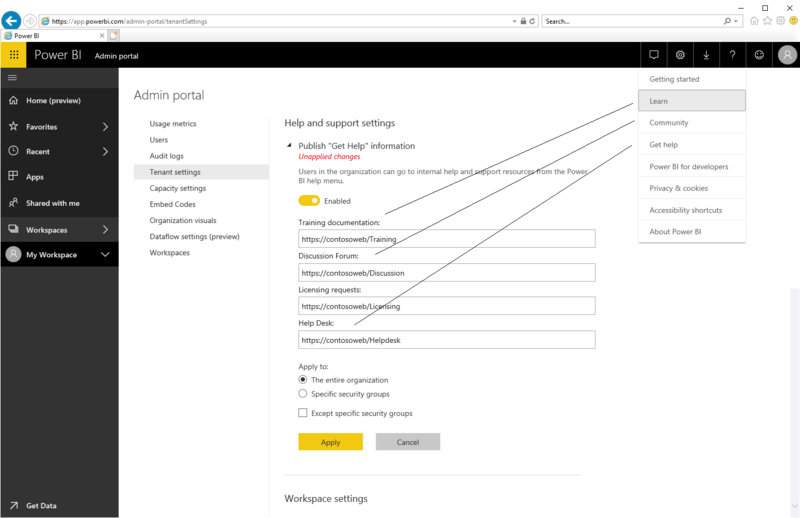 In other words, you can now direct your Power BI users to an internal website or application for license management, as depicted in the screenshots below. By specifying a URL for licensing requests, you customize the target URL of the Upgrade account button that a user without a Power BI Pro license can find in the Update to Power BI Pro dialog box as well as in the Manage personal storage page. Moreover, Power BI no longer offers the Try Pro for free button in this dialog box or storage page to ensure that Power BI guides your users reliably through the processes defined in your organization via your license management solution. And that’s it for a quick introduction of the new help and support settings. Whether your company covers technical training and support in-house or outsources these functions to an external entity, you can now leverage your help and support resources directly from within Power BI to ensure employee productivity and satisfaction. Not only can you guide your users to an internal training site, connect them with experts and peers in your organization, and offer technical support through your own helpdesk team, you can also keep track of support incidents more easily, identify recurring problems, and build up a targeted knowledge base. 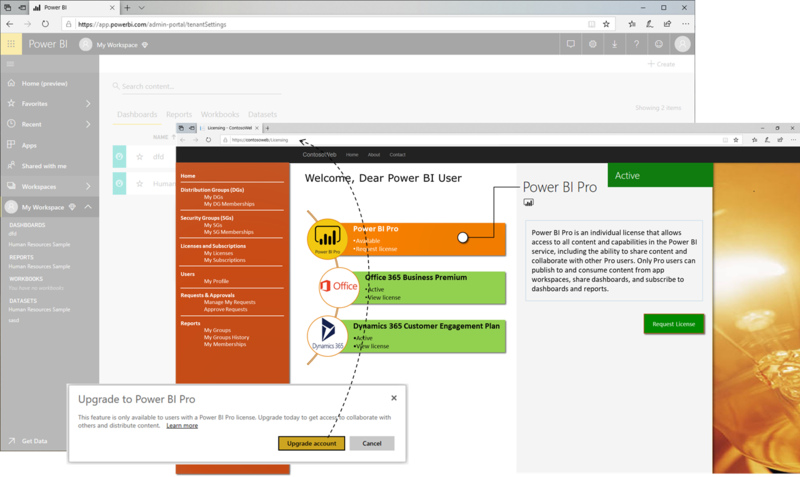 Tailoring help and support for Power BI users can deliver a significant business value, enabling employees to contact their Power BI admins for support or to obtain a required Power BI Pro license more effortlessly than before.